House Rabbit Society has been devoted to saving rabbits and improving their lives for over thirty years. Join us and thousands of members world-wide who want to make the world a better place for rabbits. Your support allows us to do what we do best–help rabbits. Join us! Your gift of $20 or more ($28 for international) includes an annual membership to House Rabbit Society! Join our very special Bunny Brigade Club as a monthly donor. Membership questions, address change, or credit card update? Email membership@rabbit.org. Why Support House Rabbit Society? House Rabbit Society is the only international rabbit rescue and education organization in the world. We have 30 chapters in 22 states plus Canada, Australia, and Italy, and educators and fosters in an additional 10 states plus Canada, Hong Kong, Singapore, Japan, Italy, and Mexico. Our headquarters is a one-of-a-kind rabbit adoption and education center in Richmond, California. The vast majority of your donations go directly to helping rabbits through rescue and education. We offer Chapter Grants to help support rescue and education activities of our chapters, and Emergency Rescue Grants, helping organizations with large rabbit rescues. As a member of House Rabbit Society, you will receive the House Rabbit Journal, featuring health articles written by nationally-known veterinarians, behavior articles by HRS behaviorists, helpful hints, fun stories, and beautiful photos and artwork, you’ll wonder how you ever got along without it. You’ll receive member discounts on rabbit supplies online from terrific companies like Binky Bunny, Bunny Rabbit Toys, Napoleon Bunnyparte, and Small Pet Select! 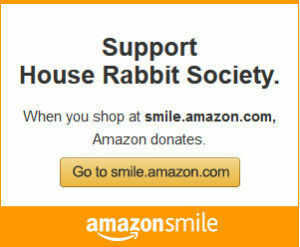 Members in the San Francisco Bay Area enjoy member discounts on rabbit boarding at House Rabbit Society headquarters. House Rabbit Society doesn’t receive government funding or accept advertising dollars. 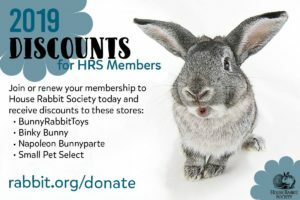 We count on the generosity of our members to fuel our lifesaving rescue and education programs, including the House Rabbit Journal, this website, our classes, conferences, videos, posters, handouts, our headquarters that saves the lives of 150+ rabbits every year, and our grant programs. See our 990 reports to the IRS which detail our income and expenses and our audited financial statements on Guidestar. 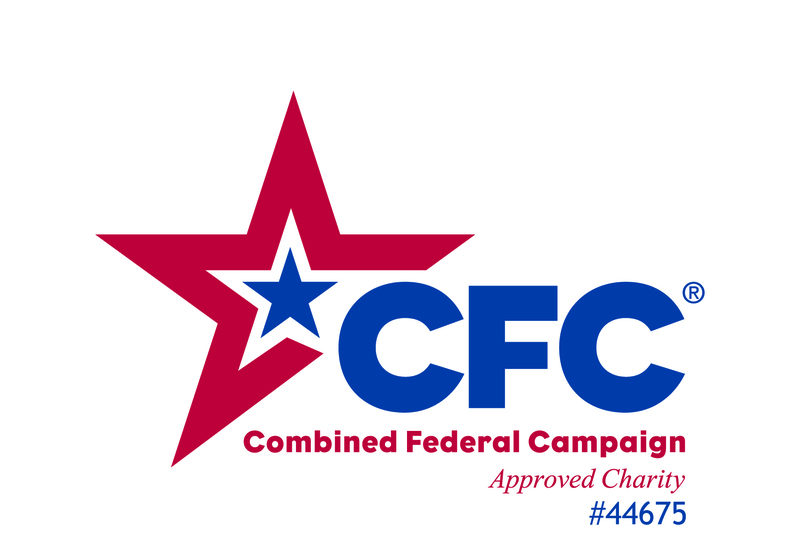 Become a local chapter member, too! Become a member of your local chapter of House Rabbit Society – find your closest chapter at rabbit.org (left sidebar) – receive news through the local newsletter, invitations to events, and in many areas, discounts on perks like hay. You can also volunteer for local rescue and education efforts. Veterinarians may choose to donate to House Rabbit Society in honor of a recently deceased rabbit patient. Select “tribute” as your option and add the guardian’s contact information in the notes. We will send a letter of acknowledgement to your client letting them know that we received a donation in the memory of their rabbit, from the veterinarians and staff at your practice. Because of these donations, House Rabbit Society will be able to continue its work to help all rabbits, and your client will know that their rabbit will live on in this work.